The cohort of patients are the complex elective surgery that needs to be performed, not the day cases—they have been raced through. The complex cases are still waiting. There are unacceptable time frames in Tasmania. People are often in pain, stopping the quality of life... So we actually have fewer beds in Tasmania than the average across the country. That is due to budget cuts... We also have the longest elective surgery waiting times. So you can see why we frame it as the perfect storm. 9.1 As outlined in Chapter 3, the Parliamentary Budget Office's (PBO) submission provided a detailed state-by-state breakdown of the difference in Commonwealth hospital funding between the government's policy announced in the 2014‑15 Budget and the former government's hospital funding arrangements under the National Health Reform Agreement 2011. The government's 2014‑15 Budget marked a fundamental policy shift away from the previous government's activity based funding model, which established a national efficient price for hospital services. Instead, it reverts to the former block funding model based on CPI and population growth. 9.2 The PBO's figures show that Tasmania will lose $1.2 billion in hospital funding over the eight year period from 2017-18 due to the government's abandonment of the carefully negotiated national health agreement. The annual funding differences are set out in Appendix 4. 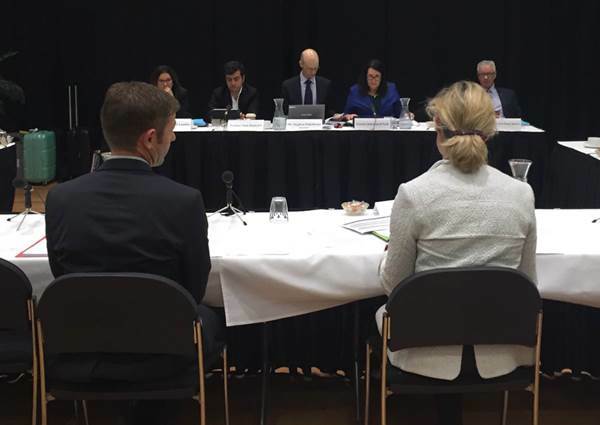 9.3 As in other states and territories, the committee has held public hearings in Tasmania over the period from shortly after the 2014-15 Budget to April 2016. This has allowed the committee to compare evidence from November 2014, April 2015, and April 2016. The evidence, as laid out in this chapter, clearly demonstrates that the dire predictions the committee heard about in November 2014 regarding the 'perfect storm' facing the Tasmanian health and hospital system, have come to pass in 2016. 9.4 Tasmanian Premier, the Hon Will Hodgman MP, reacted similarly to other state premiers after the announcement in the 2014-15 Budget that the NHRA and associated National Partnership Agreements (NPA) would be scrapped. The loss of the NPA funding was to have an immediate effect, described by the Premier as the loss of $27 million in the next financial year, an amount equivalent to 59 hospital beds or 5000 surgical procedures. What was previously agreed to – a ‘no worse-off guarantee’ that was part of the arrangement between my state and the Commonwealth – no longer exists. We’ve been blindsided by a unilateral agreement and it leaves us exposed. 9.6 Despite the cuts to federal funding, the Tasmanian Premier promised that the state government would keep to the health measures it had promised on election. ...reduced Commonwealth funding for hospital and other health services will have negative impacts on Tasmanians who live on low incomes—people who do not have the luxury of choosing private or user-pays services. Proposed additional costs on Medicare services will be felt the most by people who are already having difficulty meeting the costs of living. We know that people are already going without some essentials. Our reasoning behind these arguments is that it is well established that areas of socio-economic disadvantage have correspondingly higher health risks, higher rates of preventable hospitalisations, higher rates of chronic disease and higher avoidable mortality rates—all evidence of health inequities relative to income. Frighteningly, I think, a report by Catholic Health demonstrated that 'the most poor are twice as likely to suffer chronic illness and will die on average three years earlier than the most affluent'. The AMA's federal position is that the federal government's budget [2014-15] is actually predicated on an incorrect assumption. It is predicated on an assumption that health expenditure in this country is out of control. It is not...the actual percentage of government revenue that is spent on health has actually been falling over time and that our actual expenditure is marginally under the OECD average for percentage of GDP. The proposed measures that, if passed by the Senate, will be put in place by the federal government would have a major detrimental impact on the most vulnerable in our community. This has been shown in other jurisdictions when this has been done. Modelling by the AMA and others have shown that co-payments for medications, for example, and co-payment for GP visits will target the older, poorer, and those with chronic disease who are least able to afford these measures and will result in patients not attending general practice...in Tasmania we not only have an older and more disadvantaged community; we have higher rates of chronic disease such as diabetes, obesity and chronic heart disease. Any measures that are put in place that deter from patients attending general practice would be detrimental. We have fewer public hospital beds per head of population than Western Australia. Bed occupancy rates in both the south and the north of the state are well above the recommended 85 per cent. For the last six months at the Royal Hobart Hospital, which is where I work, we have been running at 99 per cent bed occupancy rates, which is obviously not safe or sustainable long term. The AMA, both federally and at a state level, is extremely concerned that measures suggested in this budget based on incorrect assumptions without acknowledging evidence, if put in place, would substantially harm the Tasmanian community. The Parliamentary Budget Office has calculated...that the effect of the 2014 budget would be that Tasmania would lose $1.151 billion over the eight-year period from 2017-18 to 2024-25. Of the additional $2.9 billion from the [April 2016] COAG agreement, $54 million over three years will go to Tasmania. But if you look at the AIHW data, Tasmania has fewer public hospital beds per thousand patients, increased activity and an older, sicker and poorer demographic which relies on the public hospital system more. The shortfall, even allowing for the additional $54 million from the COAG agreement, is still going to be quite devastating to Tasmania. The AMA, on both the state and federal levels, will be obviously pursuing the issue of securing adequate funding for the public hospital system into the future as a major item in the forthcoming election. We have inadequate capacity, so any funding shortfall means that elective procedures are put on the backburner, as it were. We do not deal with elective cases; we are forced to deal with acute cases. If I can give you an example from my own hospital today, as at 29 April we do not currently have any beds. At about 7.30 this morning an SMS was sent to every consultant on call saying that we have a crisis in the bed situation at the Royal Hobart Hospital, and could everybody work especially hard to try to discharge any patients who would be suitable. And we are not even in winter! The effect of funding shortfalls in the public hospital system will be felt more acutely in Tasmania than in large metropolitan areas on the mainland—Sydney, Melbourne, Brisbane et cetera. We have an older, sicker, poorer population who rely more on the public hospital system, and yet we have fewer public hospital beds per 1,000 of the population. So any funding shortfall is going to be acutely felt in Tasmania, and it will be the acute services affected, the waiting times will increase and elective surgery lists will be cancelled, as they have been already. This is the future that we see. Overall Tasmania has marginally fewer hospital beds per capita than the Australian average, and the rate of public hospital access is lower than the national average. There are long waiting times and an alarming number of patients on elective surgery waiting lists. The number of patients overdue for surgery in Tasmania has remained near or above 50 per cent for at least six years, and the total overdue number of patients make up 15.1 per cent of the total number of overdue patients Australia wide. The proportion of overdue patients on Tasmanian waiting lists far exceeds that of any other state. A concern to us is that the rate of hospital initiated postponements in Tasmania for 2012-13 was 16.3 postponements per 100 scheduled admissions. In Victoria the rate is only 6.2 to 6.8 postponements per 100 scheduled emissions. There is no doubt this is a direct impact of the closure of those acute beds over the last three years due to the budget reductions. There is ongoing tension between elective surgery and acute admissions fighting for that limited bed capacity left in our acute public hospitals. The Australian Institute of Health and Welfare statistics for 2014-15 show that, actually, we are treating fewer patients than other states despite having a sicker population. The cost weights are showing that we are treating much more complex and expensive cases in Tasmania. That is actually demonstrated on our waiting lists. The majority of our elective surgery waiting lists are showing very large over-boundary numbers. The cohort of patients are the complex elective surgery that needs to be performed, not the day cases—they have been raced through. The complex cases are still waiting. There are unacceptable time frames in Tasmania. People are often in pain, stopping the quality of life. There are only 2.3 public hospital beds in Tasmania per 1,000 population, whereas the national average is 2.5. So we actually have fewer beds in Tasmania than the average across the country. That is due to budget cuts. We have lost beds and we have closed entire wards in the north-west, in the north and in the south due to budget cuts. That has given us now a situation where we have fewer available public hospital beds for Tasmanians than anywhere else in the country. We also have the longest elective surgery waiting times. So you can see why we frame it as the perfect storm. We have a sicker population requiring more care, we have lower budgets actually providing less care, and we have growing demand for our hospital beds. I would just reiterate that we have unused theatre suites in Tasmania and we have capacity here that we could use if we had the funding. We have closed ICU beds. We have new state-of-the-art ICUs that have been built. We have closed beds there because of a lack of funding. We have a new state-of-the-art short-stay surgery unit built at the Launceston General Hospital. It was completely closed for the first six months post commission because of a lack of funding, and it was opened up for the first time only in January. It is going very well, but it is not at full capacity. All of this infrastructure is available for us to complete surgeries and start managing our elective surgery list, if we had the funding to staff it. It [mental health patients entering emergency] is probably about triaging, because there is always a group of people—in our world anyway, in mental health—that are engaged in self-harming behaviours. Is that self-harming behaviour suicidal behaviour or is it self-harming behaviour to alleviate emotional pain? That comes down to a call. Particularly when resources are tight, you have just got to make sure that you make the right call and you triage it appropriately so that you are following up on the people that you think really are going to suicide and you are not following up upon the people. But you do not always get it right. Mrs Neroli Ellis, Branch Secretary, and Mr Shane Rickerby, State, North and North-West Organiser Coordinator from the Australian Nursing and Midwifery Federation (Tasmanian Branch) spoke at the committee's hearing in Devonport on 29 April 2016. 9.15 The cuts to federal funding in the 2014-15 Budget have seen the Tasmanian hospital system hit by a perfect storm. The state government cannot hope to sustain its funding of the shortfall from the Federal Government's cuts. The need to stretch limited resources further is forcing hospitals to prioritise only the most urgent cases, while elective surgery waiting lists continue to grow. This situation is compounded further when mental health patients, who cannot access appropriate care and support in the community, are forced into hospital emergency departments. 9.16 The committee is greatly concerned that this circumstance will entrench a crisis management scenario in Tasmania which looks only for the next dollar and does not have the resources to plan ahead and deliver long-term efficiencies. 9.17 Long-term funding certainty allows for better planning for infrastructure, managing staffing, waiting times and lists, and delivers increased efficiencies overall. When hospitals are forced to operate on year-to-year budgets, there is no capacity for planning ahead and making efficient investment in staff and services. 9.18 The committee believes that without long-term funding, state and territory public hospitals will not be able to achieve efficiencies and adequately serve their citizens. The committee calls on the Federal Government to create a long-term, sustainable funding model for hospitals which allows for appropriate contributions from governments, both state and federal.